A Microfibre is an ultra fine fibre with less than one denier per filament. This makes it a fraction of the width of a human hair! These were first publicised in the 1990s, and have become popular as cleaning products due to their ability to retain up to 7 times their weight in water, and to pick up fine dust, grime, grease and even bacteria without use of cleaning products. Microfibre products designed for cleaning use are usually made from split conjugated fibres. This means that the fibres are split, which increases the level of absorbency for both water and grease. The larger surface area gives greater cleaning power, as the split fibres trap the grit and grime, leaving no residue and no scratches. Where do I use a microfibre? The terrific absorbency of microfibre makes it a great material for wash mitts and the Dodo Juice 'Captain Crevice' Wheel Mitt also takes advantage of the shape-holding properties of microfibre. Microfibres are perfect for drying your car, and the Chemical Guys Miracle Dryer is a good sized towel making drying quick and easy. Microfibres can also be used as an applicator for polishes and cleansers, allowing for topical applications and precision work. 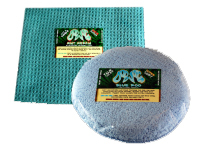 We particularly like the Dodo Juice 'Blue Roo' Microfibre Applicator Pad, which has a foam centre coupling great absorption with a fantastically soft surface. Microfibres are suited to your interior cleaning and polishing needs too, with the Dodo Juice 'Mint Merkin' Microfiber Interior Detailing Mitt being a great example. Great for cleaning your dash, steering wheel and interior plastics as well as being lint free and highly absorbent, making it the ideal glass cleaning tool.